It's a Rock-Ola Coronada Model 431 from 1966. Looks like a nice vacuum tube juke box! I was actually surprised I won it. Found a manual online and am looking forward to picking it up. Can't get there until Friday, but the nice thing is that I have the week between off work, so lot's of time to mess with it! Things weighs 262lbs! I think I got a great price. I am really excited and it's my first Jukebox. I figure I will replace the electrolytic caps and hopefully the rest are ceramic, which I would think they would be by '66 and follow the manual for some maintenance and hopefully I can get it up and running. Last edited by k8cca on Dec Sat 30, 2017 8:28 pm, edited 1 time in total. I saw that box, and thought what a deal ! I have a 1964 Rock-O-La Capri II. Can you post some of the restoration as you go ? Congratulations on wining the auction. You will probably find some film caps in there that need replacing like bumblebees or black beauties. Audio tubes can be pricey compared to radio or TV tubes. Clean and burnish switch contacts. Re-lube mechanism. Hopefully that will cover everything. Congratulations on a nice machine! Good Price too! My wife and I have fooled around with these wonderful machines since 1972. It started because of a Night Gallery episode, on TV, called "The Tune In Dan's Cafe". When that was all over we both said "let's get a jukebox for the house". We did and we've had a lot of fun and machines for the past 45 years. We never got to be experts on them just muddled along and got advice from smart people along the way when I messed something up or had no idea what the heck I was doing. Now we are too old to move them but we have our collection that goes only when we go. We've given one Nephew a Seeburg B and a Rock-Ola 1493 becuse he has great interest in the machines too. I haven't bought any new parts for a long while. Some parts dealers are: Victory Glass (Steve Loots who helped the jukebox craze along when it started), A-1 Jukebox, Jukebox World (Germany(great web site)), Musical Fun For Everyone, (Bill Butterfield (MFFE). (Used parts mostly) may still be cleaning up smoke damage from California fires but no loss of inventory. Mr. Rockola was an industrial giant. Made many things. During WWII they made M-1 Carbines among other things. They have made motor scooters, human coin op scales, unique set-ups where customers phoned in to an operator who played desired selections from a basement or remote location. A very interesting history. 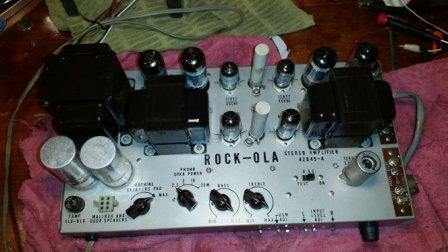 Rock-Ola still makes machines but was bought out by a fellow, Glen Streeter, (Antique Apparatus) we used to see at the jukebox shows of the day. They remake machines that appear as some of the classics such as the Wurlitzer 1015. I'm sure you will enjoy getting the machine in great operating condition and owning it. A good book to read is Juke box Saturday Night by Krivine (if my old memory is correct). Long out of print but probably still around on Ebay etc. My interest in jukes starts to wane by the early '60s models, but that one looks nice, especially for the boxy era. Good price as well - the parts are worth way more. You'll enjoy it. It looks like it was on location up through about 1984-85 from the displays in it. Well I went to pick it up on Friday afternoon at goodwill with a couple buddy's help lift it, and they were closed, so hopefully I can get it tomorrow. Was bummed out as I wanted to work on it this past weekend. Oh well more info and pics after I get it. OK, I finally got it home on 12/26. Many issues are related to grease that is thick and slowing everything down. Got it work pretty well but am having issues with the READ-IN arm. It just runs round and round. Not to familiar with this stuff. I do have a manual. Here is where I am now and pics, cause, hey everyone loves to look at pics, right? Had an uninvited guess. Luckily a short term resident as there was not much mess. 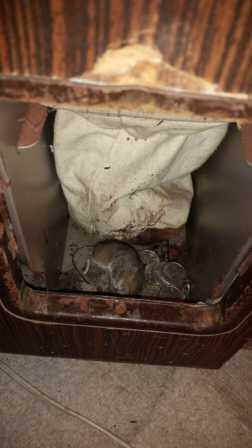 This is the coin box, and seems to have kept him in there only. There were a few 1960's and 70's quarters as well. Here is the Power amp. Really cleaned up nice, I went thru and re-stuffed the E-caps and replaced the various caps with new mylars. Amp is working great. Checked a few resistors and they where close enough. I painted the transformers as they where rusty. Looks great now! I figured that I would do that first and not have to worry about the caps failing while I was working on the rest. Would not do anything when I got it. So any ideas on the WRITE-IN arm just rotating on and on. The solenoids seem free, but is does not flip the switches on the selector wheel. Last edited by k8cca on Jan Thu 04, 2018 7:46 pm, edited 1 time in total. Got it work pretty well but am having issues with the READ-IN arm. It just runs round and round. Not to familiar with this stuff. I do have a manual. So any ideas on the read-in arm just rotating on and on. The solenoids seem free, but is does not flip the switches on the selector wheel. 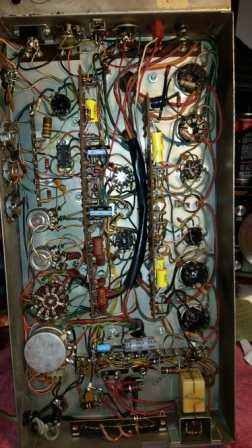 I don't know your machine but jukeboxes of that era probably used electrolytics in relay delay circuits. The other likely thing is dirty switch contacts. One of these GC 9338 burnishers are the best way to polish them. Shop around you might find them a bit cheaper. I have replaced all the electrolytic caps and have cleaned up the contacts. Still no WRITE-IN control. It just spins and does not trip the switches. I very carefully cleaned the contacts on the WRITE-IN arm. Still having a blast, had a few people over there tonight and we played pinball with the juke box playing, I have to trip the switches manually, but then it plays. Last edited by k8cca on Jan Thu 04, 2018 7:47 pm, edited 1 time in total. and does repairs for friends regularly. that may have burned out. He said it may be under a junction box, but couldn't remember. 5. Clean/Re-seat all plug-in type connectors. 6. Clean contact relays in credit unit. Thanks, Hotwax, for asking your buddy I really appreciate it! I have checked all fuses, all were good. I have cleaned all the contacts that I have found, twice, and checked continuity. I cleaned very carefully by using strips of paper saturated with de-oxit, and dragged thru contact to avoid stretching them out. It has limiting bulb. It did light up pretty brightly when buttons are pushed. I am thinking thinking perhaps there is a short since it lit up brightly? Is this like a dim bulb tester? All plug connectors have been exercised a few times. I didn't spray them with de-oxit, so maybe I will try that next. Not sure what you mean by junction box, but there was a cover on counter unit, where limiter bulb is, and many contacts there that I cleaned. I am debating about pulling the mechanism out and work on it on the bench. It is hard to see everything when mounted in juxbox. It kinda hangs in the mounts, so I would have to build a wood rack to support the mechanism, but it's really to cold to build this in the garage, so I am not sure what to do. If anyone has any more suggestions, please let me know. Check the actual wire connections to the pins in the plugs. You may need to clean the pins with sandpaper, as sometimes they like to corrode. Before you get too deep into it, see if there is a service manual. The grease you mentioned sounds like "Wildcat" grease. For some reason a lot of amusement operators loved to use this stuff in the '70s and '80s not realizing that it is a magnet for dust and dirt. I've worked on a few pinballs that were loaded with this stuff and it's always a joy to clean off. Hey guys, continuing to work on this. After reading the manual, I realized that my nomenclature was not quite correct on comments above, i had referred to the right-in arm when I actually meant WRITE-IN. I went back and edited my comments above, but it was quoted once as READ-IN, so please bear with me as I learn this thing. I also found 3 more relays late last night. These are the GRIPPER RELEASE relay, the TRIP/RELEASE INTERLOCK relay. They don't seem to have anything to do with the WRITE-IN issue that I am having, but will clean the contacts anyway as soon as I can. After reading the manual, I believe the the issue is with the ADR (ATTRACT DELAY Relay) I think that perhaps there is an issue in this circuit that is not passing voltage to the WRITE-IN hammer coil solenoid and not tripping the wobble switch. I am going to put some effort there and see if there is voltage, and if there is, figure out why it's not getting to the hammer coil. I have cleaned these contact twice, so I doubt that it is a contact issue. Here is a pic of the WRITE-IN unit ADR. The contact on the bottom of the coil (closest to camera) is the contact that makes the button selection circuit to the WRITE-IN arm. I cleaned it the best I could, but I think it's the issue due to the extensive corrosion. Last edited by k8cca on Jan Wed 10, 2018 2:58 pm, edited 1 time in total. That kind of corrosion is usually see on battery contacts or where a corrosive liquid has come in contact with the brass. I think your rodent left a parting gift! a weak baking soda solution, then rinse well again, finally dry well. Hopefully the contact points themselves survived. Contacts on switches like that are best cleaned with a flexstone, which looks like a flexible emery board. Pinball suppliers have them and they are cheap. I got the contacts cleaned up pretty well, but still no WRITE-IN functions. For some reason the relays are not pulling in. Do you have a schematic for this juke? If so, check it to see where the WRITE-IN relay gets its power from. It's possible that there's a problem "upstream" that's not manifesting itself until this relay. Also, check the relay itself with an ohm-meter if you haven't already. Relays have been known to go bad, even with no outward signs such as a toasted look. 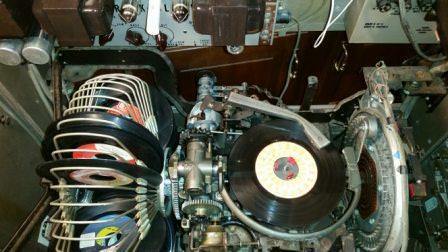 Jukeboxes aren't like All American Five radios, each manufacture did things differently. They also changed how they worked as the years passed. manual, there isn't much help people on the forum can offer. Here is a pic of the WRITE-IN unit ADR. Learn to resize your pix... 600 pixels maximum width. Your pic is over 2200 pixels wide. That insanely large pic makes the whole thread scroll horizontally. Plus you can't identify anything because it's off the screen in every direction. If you are using Windows you can download a good free photo edit software here. I copied your relay picture and ran used irfanview. You can reduce the file size if it is still too big by using the Save Quality slider. I tried to send you the reduced photo by messaging you but it won't allow to include a jpg file. Last edited by Notimetolooz on Jan Wed 10, 2018 4:50 pm, edited 1 time in total.